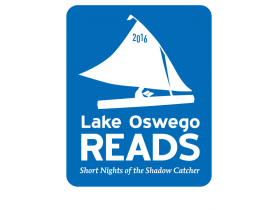 This year’s Lake Oswego Reads program features the first non-fiction selection: Short Nights of the Shadow Catcher: The Epic Life and Immortal Photographs of Edward S. Curtis by Timothy Egan. Curtis is credited by some with “the greatest photographic achievement in American history” as he compiled 40,000 photographs of Native Americans over a 30 year period at the turn of the twentieth century. The subject matter lends itself to ambitious programming on many counts. Not only are there more than 35 events planned but the events themselves offer a myriad of lenses through which to view both the author’s accomplishment and the subject he studied: historical, culinary, artistic, cultural, anthropological, horticultural, scientific and philosophical. So be prepared to be enlightened, challenged, and yes, fed as you explore the lengths to which Curtis had to go to finish his work as told by a respected and award-winning chronicler of the West. Kickoff and Book Giveaway. The Lake Oswego Library wants you to be part of the discussion so come get your free copy of Short Nights of the Shadow Catcher: The Epic Life and Immortal Photographs of Edward S. Curtis. Enjoy soup shots and a demonstration of Ranvenstail weaving. Monday, January 11, from 6:30 p.m. to 7:30 p.m. Lake Oswego Public Library, 706 Fourth Street. 503.675.2538. Ticket Giveaway to Hear Author Timothy Egan. The award-winning author will be speaking at the Lake Oswego High School Auditorium on February 10 but you’ll need a ticket to get in so start lining up early at the Lake Oswego Library on ticket giveaway day, Saturday, January 23 beginning at 11:00 a.m. You’ll need your library card. Two tickets maximum per person. (Note: Some seats may be available the day of the event; however, there are no guarantees). 706 Fourth Street. 503.675.2538. Book Discussions held on February 12 from 3:00 p.m. to 4:00 p.m. at Chuck’s Place, 148 B Avenue; February 19 from 1:00 p.m. to 2:00 p.m. at the Lake Oswego Adult Community Center, 505 G Avenue; and February 22 from 7:00 p.m. to 8:00 p.m. at the Lake Oswego Library, 706 Fourth Street. 503.675.2538. Ceremonial Tribal Food Sampling. Andrew Lintz, a member of the Native American Church, will utilize traditional culinary techniques to introduce you to ceremonial cuisine. Registration required. Friday, February 5 from 6:00 p.m. to 7:00 p.m. at Nic & Fig’s Makery, 425 2nd. Street, Suite 120. Art Show Reception and Meet the Artists. See how the book, Short Nights of the Shadow Catcher, inspired local artists. Monday, February 8 from 6:00 p.m. to 8:00 p.m. at the Lakewood Center for the Arts, 368 S. State Street. 503.675.2538. Edward Curtis and Moral Tragedy. Lewis and Clark Philosophy Professor Dr. Joel Martinez will discuss moral issues raised in Short Nights of the Shadow Catcher. Tuesday, February 9 from 7:00 p.m. to 8:00 p.m. at the Lake Oswego Library, 706 Fourth Street. 503.675.2538. Timothy Egan: Award Winning Author Presentation. Hear the author discuss his work on Wednesday, February 10 from 7:00 p.m. to 8:30 p.m. at the Lake Oswego High School Auditorium, 2501 Country Club Road. Must have a ticket to be guaranteed a seat. Free tickets will be handed out beginning at 11:00 a.m. on January 23 at the Lake Oswego Library. Those without tickets will be seated at 6:45 p.m., space permitting. An Anthropologist’s Perspective. Despite his accomplishments, Edward Curtis’ work was not without its critics. Listen as Portland Community College Professor, Dr. William Wihr, discusses the controversy surrounding the photographer. Friday, February 12 from 1:00 p.m. to 2:00 p.m. at the Lake Oswego Adult Community Center, 505 G Avenue. 503.675.2538. Docent Led Tour at the Portland Art Museum: Contemporary Native Photographers. The major exhibition at the Portland Art Museum pairs many of Curtis’ photographs with those taken by contemporary Native American photographers in an effort to invite you to reflect on how the Native experience has been portrayed through the camera lens. Tuesday, February 16 from 1:30 p.m. to 2:30 pm. at the Portland Art Museum, 1219 SW Park Avenue. Admission is $20 if you mention Lake Oswego Reads. RSVP: 503.675.2538. Lake Oswego Reads Day at OMSI. A five year project in the making at OMSI, “Roots of Wisdom: Native Knowledge, Shared Science” coincides with the theme of Lake Oswego Reads. The exhibit looks at the joint contributions that traditional knowledge and western science have made to resolve ecological and health challenges. Saturday, February 20 at the Oregon Museum of Science and Industry, 1945 SE Water Avenue, Portland, Oregon. Mention Lake Oswego Reads for an all-day admission price of $7. Special presentation from 5:30 p.m. to 7:00 p.m. 503.797.4000. In the Land of the Head Hunters. Add film making to Edward Curtis’ accomplishments. See a restored deluxe edition of his 1914 film on Sunday, February 21 from 1:30 p.m. to 3:30 p.m. at Lewis and Clark College in the Council Chambers in the Templeton Center, 0615 SW Palatine Hill Rd. Salmon Bake with Native American Music and Dance. See how it’s done the traditional way with the whole salmon threaded on sticks and cooked vertically over an open fire pit. Friday, February 26 from 6:00 p.m. to 8:00 p.m. at Lake Oswego Parks and Recreation, 1500 Greentree Rd. Purchase $10 tickets (children under 6 free) at the Lake Oswego Library or the Parks and Recreation Department. Cash/checks only. Limited space is available so buy your tickets early. Find a complete listing of all events here. This entry was posted in Lake Oswego Library, Things to Do in Lake Oswego and tagged Lake Oswego Library, Lake Oswego Oregon, Lake Oswego Reads. Bookmark the permalink.